Katharine & Michelle were honored to be asked by CFT Communications Director, Fred Glass, to present at the CFT Leadership Conference in order to share our new members materials and one-to-one member outreach program. Fred talked about the difficulties of organizing members and the success of strategies such as ours. We followed by showing off our materials, describing the visits we’ve made to new FT and PT faculty and discussing the impact of having these conversations. Not only do we put a friendly face on the union, but we are also able to answer questions, learn about problems, offer assistance and build our capacity for carrying out important campaigns, such as the PT Medical Reimbursement Stipend Campaign. Our local’s COPE Committee was languishing up until Katharine and Michelle got involved. Through our advocacy and meetings with faculty, we’ve quadrupled our COPE members since last November – and this is just the beginning! The local is looking ahead to the District Board of Trustees’ elections next fall, and with a well-funded COPE campaign chest, our goal is to run candidates who will be advocates for faculty and students. The Second Annual Part-Timer Appreciation Day on Thursday, March 12th at Skyline College was a warm and welcoming affair and an excellent opportunity for full-time and part-time faculty to put down their book bags and briefcases and get to know or reconnect with each other in a comfortable, inviting space. 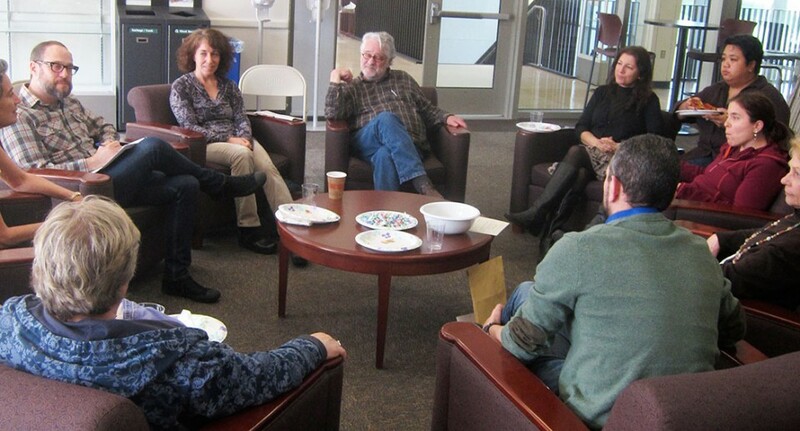 There was a healthy mix of both part-time and full-time faculty in attendance. As one part-timer remarked: “It’s great to finally get to put a face to the names that are seen on the AFT website and emails.” This year there was friendly, lively discussion in between delicious slices of pizza, plus we gave out 13 terrific raffle prizes, including 10 gift cards from the Skyline Bookstore, courtesy of Store Manager Kevin Chak, and three gift certificates from local Pacifica businesses: Salada Cafe, The Farmer’s Market natural food store and Paisano’s Restaurant. Last year one of the biggest topics discussed was the medical reimbursement issue. This year, some of the concerns brought up by those in attendance included part-timers getting assigned to ill-equipped classrooms, full-time faculty taking overload classes and the impacts on part-time positions, and part-timers’ right to be paid for SLO and other committee work. In addition, the hiring process and the need to fill full-time positions with dedicated part-timers was a lengthy discussion, as well as one adjunct asking how, exactly, are part-timers hired? Over the four-hour event there was a renewed sense of solidarity between Skyline faculty and enthusiastic support for the work of AFT 1493. CSM’s Second Annual Part-Timer Appreciation Day held on Wednesday March 18th highlighted how wonderful and important it is to be able to sit down with colleagues and talk about what we do and how our year has been going. Members of the union’s Executive Committee were on hand to chat about issues, concerns and questions and to hear stories about on-the-job successes. Adjuncts at CSM are a diverse faculty of caring professionals who take their roles seriously and care about their students. Whatever the subject, part-timers take their passion for teaching into the classroom and are eager to see their students triumph. Among topics discussed were the part-time medical stipend campaign, ways that teaching can be an art, issues around seniority, and how to access various benefits for part-timers. OMG we won First Place! When we first conceived of a colorful, friendly and informative packet of members’ materials last summer, we never dreamed we’d win an award. We just wanted to have something wonderful to give to new FT and PT faculty members when we made our one-to-one visits. Our members have appreciated our clearly written and beautifully designed packet of information cards, headed-up by faculty quotes and photos and tucked inside the union’s bright red tote bag – and so did the judges of the statewide Communications Awards! Our members’ materials and outreach program (funded in part by our SCI grant) was voted BEST in its category: “Single Effort” by a local. The Communications Awards were announced at the CFT Annual Convention in Manhattan Beach, March 21-22. More good news: we got word at the Convention that our grant for next academic year, written by Katharine, was fully funded. This means we will be able to continue to carry out our successful member outreach project and our COPE fund revitalization as well as stretch our wings into the larger community. Katharine and Michelle will be sending out a survey in early fall asking faculty members about their connections in the community and asking for leads to organizations that may be interested in working on education issues with our union. We’re already talking to the Jefferson Elementary union folks about joining forces on education-related projects.